After a few thoughtful books on books in recent weeks, it was time for some pure distraction reading: Chelsea Handler. Seem a strange choice for this bookworm? It is, but it came recommended from a very good (and very smart) friend (who also writes music reviews). 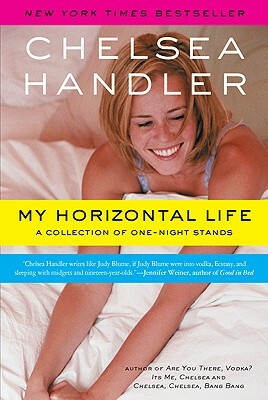 My Horizontal Life is exactly what the subtitle promises it will be: a collection of essays detailing Handler's series of one-night stands. Though I'm not familiar with Handler's stand up, it is clear from her writing that she is a downright funny gal; the kind of party animal that is simultaneously thrilling and exhausting. Her memoir is, in that respect, a perfect reflection of its author. Handler spares her readers no detail, accounting for the un-endowed and too-endowed conquests of her nightly rampages; the midget and the strange black man; the stranger and the friend. She drags in her family, her family relationships; her friends, her friendships; her thoughts on monogamy and settling, her resistance to growing up. This much material threatens to fall apart at the seams, bouncing from one subject to the next, but Handler's honesty and quick sense of humor holds it together. Bottom line: Handler is straightforward in everything: in her accounts of her past, her feelings about her experiences, and what to expect in her essays. She does not disappoint in her promise of honesty, which leaves readers laughing out loud one moment (she has an extremely entertaining inner monologue) and pondering the consequences of growing up the next. Raw, honest, and emotional, My Horizontal Life might not be perfect, but it is certainly a fun dip into something a bit different for an avid reader. Kind of like a one-night stand itself: maybe not your real taste, but a quick read, then time to move on to something else. Not to say you won't appreciate that one night, of course. An interesting unusual topic anyway!! Aww thanks for linking to my review! I'm glad you enjoyed the book. Not necessarily for me (I'll be skipping her other books) but it definitely had its moments. Which was your favorite story? Kathy - It's definitely not for everyone! I felt so bad for the midget in that story! The M&M one was one of the better ones. I read Are You There Vodka . . . a few years ago and thought it was pretty funny. But, yeah, all that over-sharing she does is pretty exhausting. Have you read Mommies Who Drink by Brett Paesel? It's also very funny and exhausting. Red - I just had hysterical images of her doing the walk of shame in a stuffed green M&M costume. Brenna - It is funny. Definitely a bit of a guilty pleasure, but not too guilty, as you'll probably finish it in about 3 hours. Trish - It is funny, but absolutely over-sharing. I haven't read Mommies Who Drink, though it sounds entertaining. I tend to avoid any books with parenting subjects as I don't have kids yet, so I worry the appreciation required to get the humor will be lost on me.